Is the Lab Safety 101 course the same as the General Biosafety course? No, they are different courses offered by different offices within EHS. Lab Safety 101 covers general lab safety topics, while General Biosafety covers the principles and practices of biosafety and how those are applied at Georgia Tech. How do I label my chemical waste? Chemical waste containers must be labeled before you start adding waste to the container. Print the label from EHSA following these instructions. Can I wear headphones in the lab? Headphones or earbuds are not permitted in the lab. You must be able to hear what is going on around you. Other forms of music/radio may be played in the lab but nothing requiring the use of headphones. Can chemicals with high toxicity be used on open benchtops? Chemicals with high toxicity are to only be used in properly ventilated spaces, such as a chemical fume hood. Please contact lab-chemsafety@gatech.edu if you need a risk assessment or process evaluation completed for a highly toxic material. How do I turn in my BOHP Confidential Exposure Questionnaire? More information may be found on the BOHP page. Why can't you tell me when you will pick up my waste? We average at least 15 individual pick-up requests each day (often more). We have found it generally more efficient for us and more convenient for our customers, if we just show up. We will, on occasion, set a definite date/time for service. We try to get your waste within 3 days of the request – if we haven’t been there and you haven’t heard from us – please follow-up. How often do I need to complete laser safety training? Laser Safety Training must be completed prior to your first use of a Class 3B or Class 4 laser. Refresher training is then required every 2 years. Can I ship my own materials? EHS personnel must ship your materials to ensure all regulations are adhered to. The penalties for failing to ship properly include fines for Georgia Tech and yourself, as well as possible criminal charges. For more information please visit the Chemical Shipping page. PPE stands for Personal Protective Equipment. PPE refers to the clothing or equipment that is designed to protect the wearer’s body from injury or infection. Please see the PPE page for more information. Who do I call to pick up solid biohazard waste? The Hazardous Waste office within EHS picks up biohazardous waste. See more details here. Who do I contact to pick up chemical waste? The EHS Hazardous Waste Office picks up all chemical waste. Submit a waste pickup request via EHSA. How do we get our waste containers returned? The waste is compatible with waste from other sources and can, hence, be combined into larger containers. The container is clearly marked with “return to” and the lab/room designation. 4 liter (1 gal) containers or smaller. 5 gal containers which originally contained solvent. Any container which, in our opinion, is no longer suitable for waste. Also note that we do not rinse or otherwise clean waste containers; you must either use them for waste compatible with the original contents or clean them appropriately. SDS stands for Safety Data Sheets, formerly known as Material Safety Data Sheets. SDSs are formal documents that contains important information about the characteristics and actual or potential hazards of the product. SDSs also include important spill and emergency response information. It is always a good idea to review the SDS for a material or chemical before using it! How do I request an ergonomic evaluation? I need to have my lab coat laundered. How do I do this and who can I call? CINTAS currently provides this service for campus. You can reach them at 617-838-1208 or via email KiddM@cintas.com for more information, or explore their website. Who do I contact if I feel I need a respirator? EHS oversees the Respiratory Protection Program on campus and can determine if respiratory protection is needed. Please see our website for more information and email us with your concerns. How do I get a vaccine / titer check / medical test that has been recommended? Visit Concentra with the medical recommendations provided to you by the Biosafety Office. They can provide all recommended vaccines or tests that you consent to. What lab and chemical safety trainings do I need to take and how frequently? The trainings that are required vary based on what materials you're working with, and all courses require a refresher periodically. See the Chemical Safety Training page for more details. Do I really need an appointment to drop off a biological material shipment? Yes, you really do need to schedule an appointment. Showing up unexpected or trying to coordinate a shipment drop-off the day-of your desired shipment will likely result in disappointment. All members of the Biosafety Office may be busy or out of the office when you show up to ship without an appointment. To ensure that someone is available to receive your samples and has reserved time to ship your package, please be sure to schedule an appointment using the Shipping Appointment webform. What do I need to bring with me to my biological material shipment appointment? I'm doing a renovation/demolition project. Do I have to do a lead survey or lead abatement? Most likely not. We do not do lead abatement projects very often, because we currently have very few spaces that are considered to be "child-occupied facilities" that are in danger of having lead paint. We do require that contractors use lead-safe best work practices for every renovation or demolition project. Can flammable materials be stored in refrigerators? Flammable materials can only be stored in flammable-safe refrigerators or explosion-proof refrigerators. Flammable materials cannot be stored in conventional refrigerators. Electrical sparks from a conventional refrigerator can ignite flammable vapors that build up inside. I ran out of chemical inventory barcodes. How do I get more? The GT inventory barcodes can be ordered via the Barcode Request feature on our EHSA. Submit the order via EHSA and your barcodes will be delivered to your lab. Do I need to autoclave my biological waste first before having it picked up? Solid, non-sharp biohazard waste from BSL-1 labs and BSL-2 labs may be disposed of directly into EHS-supplied biohazard waste boxes lined with red biohazard bags. These boxes are decontaminated offsite via incineration. I'm using OnSite for biological items, but I am having problems with it. What should I do? Email us with the issue you are having, with as much detail as possible. Screenshots are very helpful. How do I know if I need a Material Transfer Agreement (MTA) for my biological material shipment? This determination will be made by the Office of Industry Engagement after they review your paperwork for MTA initiation (i.e., Incoming Material Transfer Initiation Form, Outgoing Material Transfer Initiation Form). They will let you and Biosafety know whether your sample needs an MTA and when an MTA is approved. I completed IEN's Cleanroom Orientation that included X-Ray Safety Training, but I still don't have access to the x-ray machine I need to use. What do I do? Email the Office of Radiological Safety. Common reasons include not having completed a Form B for that x-ray machine or not having completed the X-Ray Refresher Training, required every 2 years. My radioactive material, x-ray radiation, or other radiation related posting/label is lost or damaged. How can I get a replacement? Contact the Office of Radiological Safety and indicate which posting needs to be replaced. ORS will provide a new posting. I have a full glass disposal box. Who should I contact to pick it up? Glass disposal boxes must be disposed of by lab personnel. Once the box is 3/4 full, tape the glass disposal lid onto the box and take the glass disposal to the appropriate waste disposal area. Can I use my scanner to reconcile, or can I borrow one from EHS? All Voyagers used with Chematix should work with EHSA. They Voyagers do not have a very long range, so sometimes do not reach from your computer to your chemical storage area. EHS offers loaner Bluetooth scanners with a range up to 50 feet. How often should I be checking the eyewash in my lab? Eyewash units that are located on sinks must be checked weekly by lab personnel. For those not located on sinks, they must be checked annually. My fume hood is not working. What should I do? Contact EHS: lab-chemsafety@gatech.edu and an EHS professional will make the appropriate assessment of the next steps. How do I request a general safety audit of my instructional or workplace area? Email General Safety to schedule a jobsite safety evaluation. Please allow up to 5 days for appointment scheduling. 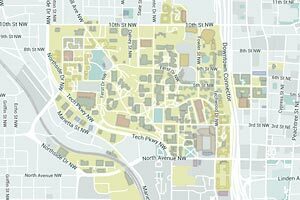 EHSA is the database used to track chemicals at Georgia Tech. Please see our EHSA page for more information. What biosafety trainings do I need to take and how frequently? The trainings that are required vary based on what materials you're working with, and all courses require a refresher periodically. See the Biosafety Training page for more details. How do I know whether I need to submit an IBC application or a BMSC application? Check out our biosafety protocol submission page to learn more about each of these approval processes. How do I register for the online van safety course? To register for the online van safety course, please visit Trains then search for “(EHS) 15 Passenger Van Safety” or go directly to the course page. Then follow the instructions to get enrolled in the course. What do I need to do to become a Laser User? Complete the initial online laser safety training (instructions here). Complete and print Form LU-1 (Laser User Registration) and sign as the Laser User. Obtain the signature of the Laser Supervisor for whom you will be working. Scan and email the form to ORS. What material can I use as a laser barrier or laser curtain in my lab? The material to be used depends on the laser class and a variety of other factors. The LSO will determine the most appropriate barrier type as part of a laser hazard assessment. Generally, Class 4 lasers and some higher-powered Class 3B lasers will require the use of "laser rated" barrier material that has been tested to withstand up to a certain laser intensity and has been tested to be flame retardant. I have a piece of equipment that I used with radioactive material. It needs to go to a lab without radioactive material or be used for purposes that don't involve radioactive material. What do I need to do? Contact the Office of Radiological Safety so that a contamination survey of the equipment can be completed before it is moved. How do I get a copy of a biosafety course certificate? We will email you a copy of your certificate. We can only provide records for biosafety trainings. If you need a certificate from another group in EHS, contact someone in that group. How do I request forklift certification training? Email General Safety to schedule a session for this on-demand course. I don’t have a computer with internet in my lab. How can I reconcile? You can use a laptop, tablet, your smartphone etc. Your school may also have laptops or tablets to loan. Reconciliation process on other devices follows the same procedural steps to working with your stationery computer. Pair the scanner with your device (if you use the EHS scanner, go to Bluetooth option and “add a new device”). Open the reconciliation EHSA page on your device. Start reconciliation process on your device like you would do on your computer. Remember about clicking in the barcode field before starting scanning. Does Biosafety provide sharps bins? No. Labs may purchase these from any lab supply company. How often do I have to reconcile my chemicals? Laboratories, facilities maintenance areas, and all GT areas in which chemicals are used or stored are required to reconcile chemicals semi-annually (deadlines: June and December). EHS submits the GT Campus Inventory Report to the Board of Regents shortly after (as required by Georgia law). First responders use the GT campus inventory to assess the situation in the case of an emergency. Please see the EHSA page for more information. How do I get a biosafety cabinet decontaminated? Why the unit needs to be decontaminated. Note that the unit will likely require re-certification depending on what is done to the unit after decontamination, something that also needs to be coordinated through the Biosafety Office. Where or how do I get bio waste bags and boxes? Please take only what you need, and let us know if stocks are empty or low. What do I need to do to become a Laser Supervisor? You must be a full-time Georgia Tech faculty or staff member. Complete and print Form LU-1 (Laser User Registration) and provide your signature as both a Laser User and the Laser Supervisor. What can I wear to lab? Pants that are frayed or torn are not recommended. Crop tops are not allowed. Canvas shoes, open front or back shoes, open weave shoes, ballet flats, Crocs with holes are not allowed. The best shoes for lab work completely enclose the foot and can be wiped clean. What do I need to bring with me to my chemical shipment appointment? Who needs to enroll in the Biosafety Occupational Health Program (BOHP)? Anyone working with animals or biological materials. See more information here. How can I get access to OnSite for biological items? What office conducts export control review? The Office of Research Integrity Assurance conducts export control review. The Occupational Safety and Health Administration defines a hazardous chemical as "any chemical which is a physical or a health hazard". My biosafety cabinet / laminar flow hood / clean bench is not working properly. What should I do? How long the unit has been malfunctioning. Put an out of service sign on the cabinet to prevent others from using it. Biosafety will get a technician on campus as soon as possible. How do I know if I'm enrolled in the BOHP? Biosafety will contact you with required trainings and recommended medical monitoring. If it's been an extended period of time since you initially registered, email us with your full name and the PI/professor you registered under and we will let you know if you are indeed registered. If I need to drive institutional vans, do I have to take defensive driving training as well as van safety? Yes, the defensive driving course is a prerequisite to the van safety course. You must either take the online defensive driving course or the in-class defensive driving course. How do I request a specific occupational safety course for my operational area? Email General Safety to schedule an occupational safety awareness training. What are the differences between in-class defensive driving course and the online defensive driving course? The in-class defensive driving course is a 6 hour defensive driving course developed from the National Safety Council, this course is not a point reduction course. After successful completion of this course a certificate is generated that allows for insurance deductions. The online defensive driving course is a defensive driving course that is 45 minutes in length, after successful completion of this course a certificate is generated, however this course does not qualify for insurance deductions. Both course certification period is 3 years. Why can't I use an open flame in a BSC? The flame itself creates turbulence within the BSC which will disrupt the airflow inside the unit causing convection rather than intended laminar air flow patterns. Laminar air patterns maintain both a clean work environment and protect your health from what you’re working with. Cabinets are not designed for high heat; heat that can disrupt electrical equipment within the unit itself and grossly damage the HEPA filter leading to a loss of containment. Most BSCs recirculate a percentage of air, so were the flame to go out, flammable gas would collect within the cabinet and reach explosive concentrations. This policy is in accordance with recommendations from numerous agencies including the Centers for Disease Control and Prevention (CDC), the World Health Organization (WHO), and major biosafety cabinet manufacturers themselves. How do I reconcile my chemicals? Follow the instructions here in the EHSA User Handbook. How do I document my corrective actions for my lab inspection? All lab inspection corrective actions must be documented in EHSA following these instructions. If you are having any problems with EHSA, please email us with as much detail as possible. How can I check the last time I took biosafety training? Log in to www.trains.gatech.edu and view your own personal transcript. It should have all previously attended courses listed and the dates that they were completed. How often should I be checking the safety shower in my lab? Safety showers that do not have a drain must be inspected at least annually by Facilities Management. Safety showers that are drained should additionally be checked annually by lab personnel. EHS encourages lab personnel to check these themselves as often as possible if there is equipment and personnel to do so regardless of the presence of a drain! How do I determine what laser eye protection to buy? The LSO calculates the optical density needed for protection against the wavelengths in use in your lab. There are occasions where multiple optical densities are needed for a given wavelength. For instance, an optical density of 4 might be needed for protection against an accidental exposure to a direct beam. For the same wavelength, another pair of eyewear with optical density of only 2 would be sufficient for alignment purposes only. Be sure to communicate with the LSO. My lab plans to surplus our x-ray machine Is there anything special I need to do before asking Georgia Tech Logistics to pick it up? Yes. Notify the Office of Radiological Safety that you would like to surplus your x-ray machine. ORS will remove the x-ray tube (if applicable), and provide a letter indicating to GT Logistics that it is acceptable to surplus. I'm a non-GT-affiliated student/employee/researcher/visitor, and am required to take biosafety trainings. How do I sign up for these trainings? Email us to register for an upcoming classroom session. You will not be able to log in to www.trains.gatech.edu to register. Are GT Emergency Procedures required to be posted in the lab? GT Emergency Procedures are required to be posted on the interior of all lab exit doors. It must be filled out in its entirety. You can order the poster via EHSA, using the Barcode Request feature. This feature offers variety of lab-safety items, helping to improve the lab safety in your lab. What operating height does my sash have to be on the fume hood? Fume hoods should be operated with the sash at 18". Please remember to close the sash when the hood is not in use. My autoclave is not working. What should I do? Call Getinge (1-800-660-1687) to report the problem and provide them the serial number of the autoclave and/or boiler. Email the Biosafety Office (biosafety@ehs.gatech.edu) indicating: the unit location, the problem, when you notified Getinge and if they have returned your call. Post the Out of Service sign nearby indicating when you called Getinge to prevent the continued use of a broken autoclave. How often do biosafety cabinets / laminar flow hoods / clean benches need to be recertified? All biosafety cabinets, laminar flow hoods, and clean benches must be re-certified on an annual basis, as well as after they are repaired and after they are moved to a new location. This service is offered through a Biosafety Office managed vendor and can be coordinated through Biosafety. Where do I get containers for waste? Laboratories are responsible for providing their own waste containers. Most labs simply use empty containers that they have generated (make sure the waste is compatible with the initial contents or the container has been thoroughly cleaned before adding waste). We will under certain circumstances and after coordination, provide 5 gallon and larger containers, please note that if you are using large waste containers such as 30 gallon drums, you may be subject to additional administrative and safety requirements. How much flammable and combustible materials can I have in my area? No more than 120 gallons of Class I, Class II, and Class IIIA liquids, combined, may be stored in a storage cabinet. Of this total, no more than 60 gallons may be of Class I and Class II liquids, combined, and not more than three such cabinets may be in a single fire compartment area. (i.e., a room that is separated from other rooms/areas by fire walls). Please refer to the Lab Safety Manual, under "Flammable and Combustible Liquids" then "Flammable Storage Lockers and Refrigerators" for more information. My lab purchased uranyl acetate for staining electron microscope samples. Are there any Georgia Tech radiation safety program requirements for uranyl acetate? There are a variety of uranium and thorium compounds (most commonly acetates and nitrates) that can be purchased from a vendor without showing proof of a radioactive material license. Uranyl acetate is one of the compounds. These compounds typically fall under what Georgia regulations define as a General License. This document describes the minor requirements of the Georgia Tech radiation safety program for these types of compounds. Requirements regarding collection of waste as well as transportation or shipment of the source must be followed. I need more biohazard waste boxes. Who do I contact? The Hazardous Waste office provides biohazard waste boxes and the red plastic liners for these boxes. Visit their site for who to contact. What time do I need to have my shipment to EHS in order for the shipment to go out the same day? I'm doing a renovation/demolition project. Do I have to do an asbestos survey? What if the building is less than 10 years old? Yes, unless we have survey data of the space already. Usually we can figure out if a survey is needed with a quick site visit and check of our records. While filling out an IBC application, how do I classify my IBC protocol? Go to Section III of the NIH Guidelines for Research Involving Recombinant or Synthetic Nucleic Acid Molecules to determine what category your work falls under. If you need assistance, contact the Biosafety Officer. How do I get my radiation safety training certificate? The certificate will be sent to your Authorized User (or if IEN, Charlie Turgeon) within 1 month of your training. If your Authorized User doesn't have it, email ORS to request it. How often should I be checking the fire extinguishers in my lab? Fire extinguishers must be inspected monthly by lab personnel. The reverse side of the tag should contain an area for this monthly check to be documented. Checks include physical condition of the fire extinguisher (i.e. no visible damage to cylinder or hose); presence of the pin in the handle; a plastic tab that has not been broken (indicating that It’s been discharged); and finally, a check of the gauge (if present) to verify it is not over- or under-charged. How do I register for the online defensive driving course? To register for the online defensive driving course, please visit Trains then search for “(EHS) Defensive Driving Online Tutuorial Access Request” or go directly to the course page. Then follow the instructions to get enrolled in the course. Concentra is located at 688 Spring Street NW, Atlanta, GA 30308. Physically, it’s located across the interstate, just south of Tech Square and directly north of the Varsity. If you take the underground tunnel to cross the highway, Concentra will be on your immediate right upon exiting the tunnel and on Spring Street. Their phone number is 404-881-1155.